RS-485. RS-232, Modbus®, CANbus®,CANopen® SPI. As a fully submersible device, the Paine™ 220-30-020 subsea pressure and temperature transmitter from Emerson is a reliable solution for pressure and temperature measurement in remote subsea systems. Offering pressure ranges of up to 15,000 PSIA and temperature measurements between -4°C up to +60°C, Emerson's Paine™ transmitter also features digital measurement accuracy and utilises the industry-standard CANopen® digital subsea instrumentation interface. With an all-welded design, this transmitter offers long-term subsea operation and meets the requirements of API 17F / ISO 13628-6 and CiA® 443 (SIIS level-2 device). 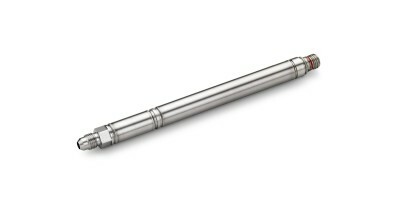 Engineered to provide digital measurement accuracy, Emerson's Paine™ 320-10-010 high precision pressure and temperature transmitter series is an ideal solution for new tool designs and retrofits. This transmitter from Emerson comes with digital network flexibility as well as programmability, and is fully compensated and calibrated for pressure ranges of up to 30,000 PSIA. This durable device withstands extreme conditions and is an ideal choice for down-hole drilling pressure and temperature measurement at temperatures of −40°C to +155°C. Please see the datasheet in the Technical Library tab for the for Paine™ 320-10-010 series, which includes details on standard products available as well as proof and burst pressure ratings.